Willem van de Velde II was one of the leading 17th-century Dutch marine painters. Trained by his father, Willem van de Velde I, with whom he later worked, he continued his studies in Weesp with Simon de Vlieger, an artist who specialised in marine compositions. Willem van de Velde II’s work falls within the scope of classical Dutch view painting and the artist created atmospheric effects not to be found in the work of previous painters. In order to devise his compositions, Van de Velde made sketches from life and also sailed with the fleet in order to gain first-hand knowledge of naval battles, following the custom of his father. The type of composition that he produced was well received by clients, who appreciated their rigorous organisation and detailed rendering of rigging, hulls, sails and other elements of the vessels, as well as other elements related to navigation such as the direction of the wind, the position of the sun, the light and movement of the water. Van de Velde II depicted both rough and calm seas and included almost every type of boat to be found in his day, from warships to commercial vessels. The precision and detail of his drawings have made them extremely useful for a knowledge of ship-building in the 17th century. The present canvas depicts the Dutch fleet moored in the Goeree Roads at the entrance to the Haringvliet, one of the canals on the estuary of the Mose. Just visible on the left in the far distance is the city of Goedereede with its church tower. The painting was dated by Gaskell to around 1672–73, before Van de Velde II moved to England. Van de Velde II structured his composition through two large diagonals created by the vessels that cross the picture surface from left to right. The first diagonal is formed from the four larger ships located nearer to the foreground. The second line, comprising three smaller ships, runs parallel to the first line and behind it. Between the two principal lines is a third group of smaller boats and sailing vessels crammed with passengers. In the foreground Van de Velde creates a dark area on the water from the shadow of a cloud, a device that increases the sense of spatial depth. 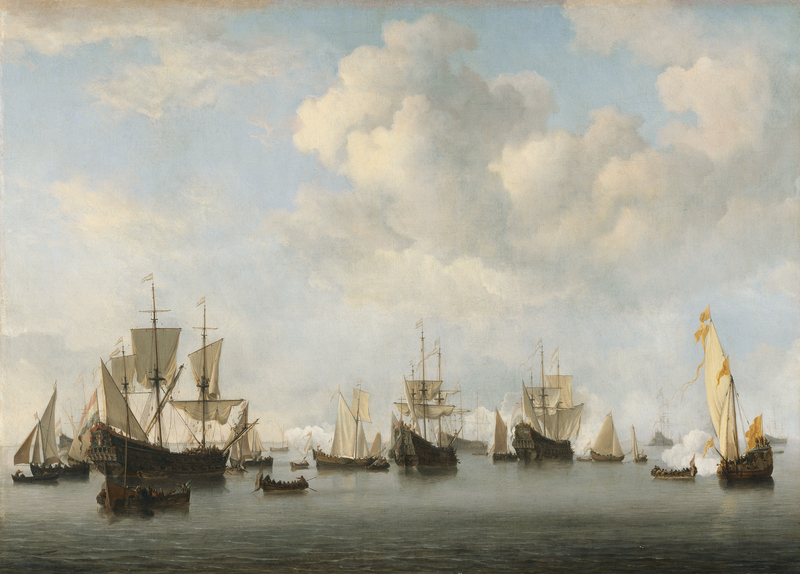 This canvas contains all the elements that brought Van de Velde II fame: his careful and refined draughtsmanship that has allowed many of the vessels to be identified; a large number of vessels in a single scene; a balanced composition achieved through the alignment of the ships; and a tranquil atmosphere conveyed by the gentle movement of the water with the lapping waves. His skills are also evident in the importance given to the sky, which offers a fine study of the density and movement of the clouds, contrasting with the whiteness of the billows of smoke from the cannon shots. It would appear that Van de Velde II used a series of drawings made by his father at first hand in order to devise this composition. Willem van de Velde I arrived in Goeree where the Dutch fleet was stationed in September 1664 and remained there until December when the fleet set sail. During this time he executed the preparatory drawings, of which more than fifty have survived. Among the ships that have been identified are the Vrede (Peace), the largest vessel, located in the foreground on the left and adorned with a figurehead of a woman in red and blue with a palm branch in her hand. The large vessel in the centre is De Drie Helden Davids (The three Heroes David), built in 1654. Het Huis te Oosterwijk(Osterwijk Castle), the third in the line, was built in 1653 and belonged to the Admiralty in Amsterdam. Located in the line behind them and next to the Vrede is Het Hof van Zeeland (The Court of Zeeland), while between the Vrede and Het Huis te Oosterwijk is the Eendracht (Unity), the flagship of Jacob Baron van Wassenaer van Obdam, Admiral of the Fleet. Lastly we see the Klein Holland(Small Holland).